Recipe for Curried Prawns made with lengkuas, lemongrass, fresh turmeric, buah keras, chillies, shallots, belacan and coconut milk. Mix prawns and all other ingredients except the oil. Put oil in frying pan and when hot put in prawns etc. Simmer, stirring occasionally, till prawns are properly cooked and dry. Do not over cook as prawns will be tough. Garnish with coriander leaves and serve hot with Jasmine rice. Malay Wedding Menu & Recipes – Sweet and Sour Fish! hey this is very creative! 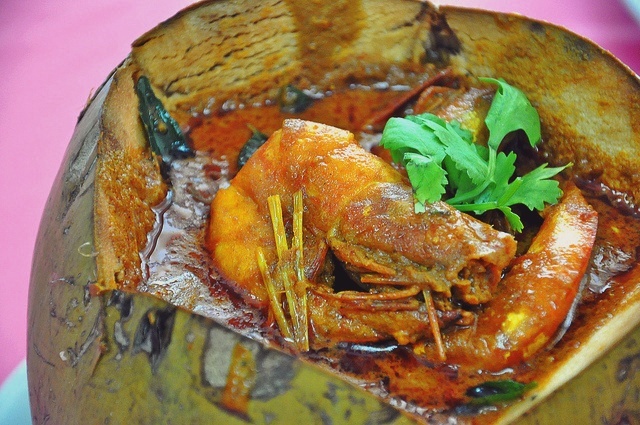 i like those prawns in coconut. i like the pictures here on this food blog too.